I’ve been in the travel industry since Methuselah was a boy, and have been fortunate to have traveled to a great many places, including here in the US. On this particular occasion I was the host to a group in a New York restaurant. A great meal, good service and an enjoyable if not spectacular experience. I left a tip of 15%, which would be considered very good in the UK. Imagine my surprise at being approached by the Maitre d’ who asked what had been wrong with the meal. I told him nothing was wrong, it had been a perfectly good evening. I was told in definite terms that I should be tipping at 20-25%. In Europe, 10% is pretty much the norm. 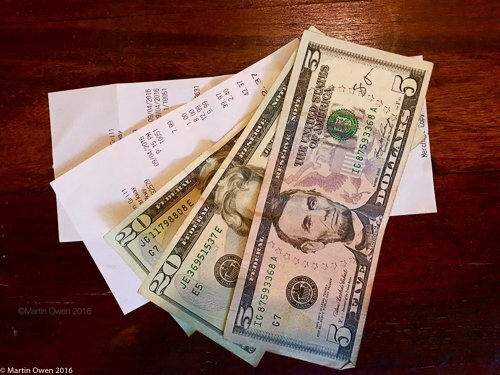 In some places in Scandinavia, and certainly in New Zealand, tipping is considered an insult, and may result in a tirade from the person tipped – just don’t do it! It’s true that we should be aware that different cultures around the world expect different behaviors and we should be aware of that when traveling. But should we be as guarded traveling in our own country? Surely a tip is a tip, wherever we are in the USA? I’ll let you read The Economist piece yourself (it’s at http://ow.ly/xStZ303ZhdX). It’s worth a look if only to add to your confusion. This also let me to consider something that’s been happening here on the Northern Gulf Coast of Florida, particularly the piece known as The Emerald Coast. The shortening and concentration of the family travel period has opened up the rest of the year to new markets – people who can travel without kids, and at short notice. Primarily Millennials and Zoomers (Younger Boomers, Boomers with Zip!). These groups have different requirements than the families. They want experiences, great food, the ability have what they want when they want it – now. They also behave differently. Zoomers tend to have more disposable income, and Millennials tend to do more physically demanding experiences – although those are both very much generalizations. The local Destination Marketing Organizations (DMOs – Tourist Boards, CVBs etc.) have been consciously aiming their marketing up market. Going after more affluent sector of tourists. Their efforts appear to have worked. For the 30A area (South Walton) this has certainly worked. Their area has been inundated with high spending customers. In fact, let’s face it, they’ve been inundated with all types of customers! The same appears to be true of all the areas along the Gulf Coast. Tourist Development Tax (Bed Tax) is up across the region, and Okaloosa in the center of the region, appears to have had bigger tax growth than other neighboring DMOs. However, many local restaurants, particularly in the Destin area are complaining that tourists are not spending like they used to. Is this a justifiable view? I’ve spoken to a number of restauranteurs and to accommodation providers. The later have said that their occupancy has been up, and their ADR (Average Daily Rate) is also up. One hotelier told be he goes out into his parking lot on Memorial Day and checks out the kind of vehicles that are there. He said that this year, there were far fewer trucks and many more upscale SUVs. That would surely show that the income group is probably rising. He also said that on the beach there were far fewer cut-off T-shirts and many more upscale bathing suits. There’s no real science in this approach, but he’s been doing this for many years an he can see a distinct correlation to the amount spent. Pushing the restauranteurs on if they are actually seeing a decrease or stagnation in the amounts visitors are spending led to a revelation. It’s not the amount of the bill that’s declining, but the amount of the tips. Tips in Florida generally (in restaurants) have been around 14% for some years. That’s a marked difference from other parts of the US. The North East is closer to 25%. The reason for this is possibly due to the number of overseas guests visiting Orlando, Miami and the other internationally visited areas. Remember that overseas visitors are used to tipping less. Up here in the Panhandle though, tipping has been closer to 20% traditionally. Not too many international guests up here, so what’s going on? Digging further and doing some research I’ve found that there are other factors in play. It appears that Millennials tend not to tip at the same rate – check out the following articles (http://ow.ly/Xd9u303Zprh. http://ow.ly/26Vo303ZpBs) and try Googling ‘Tipping and Millennials’ and see how much confirmation you get. It also appears that Zoomers will not just tip at 20% regardless. They modify the tip depending on the service received. It’s not as simple as ‘we’re attracting the wrong people’. It appears we’re attracting the right people, but those visitors are not behaving in the way they used to. Another indicator that the tourism market is changing and it’s changing rapidly. There’s a tip for you! How Micro-Moments are reshaping the Travel Customer Journey – Google report. Google have just published a report that examines how people plan for travel. It examines the devices (that’s definitely multiple devices!) that they use and when they use them. The report is certainly well worth reading if you’re in any way involved with the tourism, hospitality or associated industries. It runs to 41 pages and it hones in to what Google terms ‘micro-moments’. It certainly shows that habits are changing fast. If you’re not seeing the rise in mobile bookings in your business, believe me you will – and sooner than you expect. currently 40% of travel site visits in the US come from mobile devices. You’d better make sure that your site handles mobile in a clean and efficient way. The report has a number of case studies which are worth taking time to study. These Micro Moments break down into ‘I want to get away moments’, ‘Time to make a plan moments’, ‘Let’s book it moments’, and ‘Can’t wait to explore moments’ . Depending on your business, you could fit into one or more of those. Be assured that you’re not the only site people are looking at for your particular moment. To be successful you need to actually be in the booking space, and you need to offer a useful service. You need to be part of the ‘experience’. 52% of travelers with smartphones said they’d switch sites or apps if a site took too long to load. 45% said they’d switch if it takes too many steps to book or get desired information. Have you looked at your booking process on a smart phone recently? Only 23% of leisure travelers are confident that they can find all of the same hotel and flight information on their smartphone that they can on their desktop. 2/3 of leisure travelers double check prices on a desktop after shopping for flights on a smartphone. Over 50% make the switch to double check hotel prices. 94% of leisure travelers switch between devices as they plan or book a trip. Where does that leave your tracking systems? There’s more and we’re happy to consult on this and other similar issues. Contact us for more information.